Tilt and turn windows are a versatile window, well-suited to both residential and commercial properties. When tilted back, these windows allow for ventilation without compromising on safety, but can also be opened inwards for easy cleaning or outwards as a fire escape window. They are also useful for applications where a projecting out sash would be inappropriate. Aluminium tilt and turn windows have many selling points compared to uPVC frames, as they are notably slimmer, and offer uncluttered views and plenty of natural light to enter the room. Keep reading for more information about the product specifications for aluminium tilt and turn windows or read more about buying from Amberley. 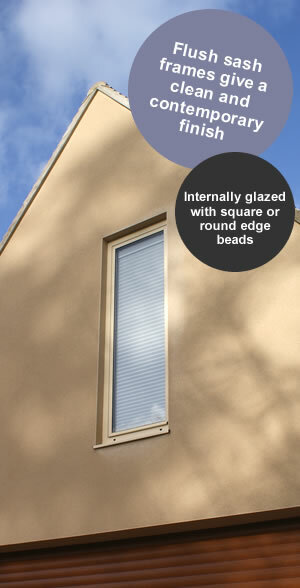 Polyamide thermally broken tilt and turn window with 51mm frame depth. Flush sash frame gives building facades a clean, contemporary appearance. Internally glazed with square or round edge beads. Our tilt and turn windows are available in any standard RAL, British Standard or silver anodised finish, in single colour or dual colour. Pivot windows go one step further than tilt and turn windows, swivelling in one smooth action either horizontally or vertically to allow for easy cleaning of the outside pane from the interior of the building. Like the tilt and turn, our aluminium, thermally broken pivoting window system comes with a 51mm frame, internally beaded and with a range of colour and finishing options. Get a fast quote on our aluminium pivot windows. This full swivel option features fully concealed reversible hinges with restricted openings. It is the window of choice for consumers who are looking for maximum ventilation in their property and ease of cleaning. Choose this high performance top or side swing window for domestic and small or medium commercial applications. Contact us for a fast quote for aluminium reversible windows.